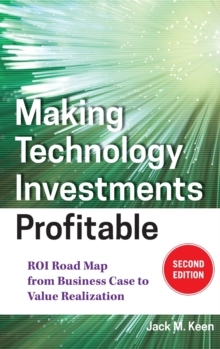 A guide to getting the crucial business case right?every time Showing professionals how to calculate the value of typical budgeting and funding requests quickly and easily, Making Technology Investments Profitable, Second Edition applies the "Value Realization" process, using proven strategies that maximize the business payoff from IT projects. Filled with case studies, this innovative book enables managers to confidently quantify, in a matter of minutes, the true business value of funding a desired project. * New edition explains how to proactively manage the conversion of a business case's value promise to its value realization * Includes dozens of new case studies on realizing maximum value from IT enabled investments from various industries and around the world * New checklists and tables * A dedicated Web site containing additional material, case studies, chat rooms, and blogs on the value-realization process The Second Edition provides senior executives, project managers, and technical staff with new insights on how to get the crucial business case right, while also explaining how to proactively manage the conversion of the business case's value promise into the value reality of a completed project.